Ah, Thanksgiving. The long holiday weekend where you have a chance to spend quality time with the fam, get a jump on your holiday shopping and eat an obscene amount of mashed potatoes, turkey, pumpkin pie and insert-your-favorite-Thanksgiving-calorie-bomb here. Indulging in one massive dinner a year isn't going to do too much damage to your diet. However, those inevitable Thanksgiving leftovers are another story. And while it's tempting to eat your way through the contents of your fridge until the last scrap of stuffing is gone, we've decided to try something different this year. In an effort to be a bit more health-conscious the day after shamelessly gorging, we asked culinary nutritionist Diane Henderiks, R.D., regular on-air contributor for ABC'S "Good Morning America," to show us how to give those decadent Thanksgiving leftovers a healthy makeover. 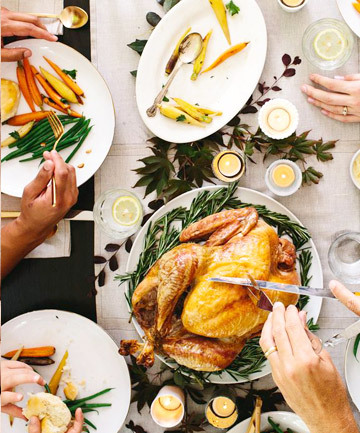 We also asked Joy Dubost, Ph.D, and spokesperson for the Academy of Nutrition and Dietetics to weigh in on the nutritional value of these Thanksgiving leftover recipe makeovers so you can keep on eating, guilt-free. There are some great ideas here, but even with ice cream I couldn't eat pumpkin pie. I've always hated it! Chili sounds great, so does everything else. Haven't even had thanksgiving dinner yet, but this is making me hungry! Mmmmm.... Leftovers. I think these ideas are super creative. Leftovers dont' really last that long in my house becuase I have so many siblings. BUT my girlfriends and I are going to have a leftover dinner party on Friday; so that should be interesting. I like the idea of Turkey chilli. Some of these look interesting to try. Should be fun trying them out. Very creative! I usually make sure my meal is healthy to begin with--very flavorful, perfectly cooked, and vary my temperatures and textures. Buttermilk makes mashed potatoes decadent without the fat. In my wok, I carmelize red onions in olive oil, then stir fry in blanched green beans and red pepper. I use olive oil and cajun spices, then grill my turkey (yes, even in the snow). Cranberry sauce with 100% juice, orange zest, apples, and minimal sugar. Happy Holidays!